Many people thinking of folding bikes as a bit of a joke. This is because in the past many folding bikes were unwieldy and awkward to ride, and some models were prone to collapse. However, in recent years, new designs have come to the fore, and folding bikes have greatly improved - so much so that any negative reputation is no longer deserved. Of course, just like any other type of bike, folding bicycles do require that the designers have to make some choices and compromises in the design between various different priorities. In the case of folding bicycles, designers have to strike a balance between the folding capability, the quality of the ride, and the price - and you will find that different models of folding bikes have struck this balance at different points. For example, some folding bicycles (mainly those designed for short hops) are designed to be simple to fold and unfurl every time they are ridden, whereas are designed to be kept unfolded most of the time and only folded away once in a while. So why choosing a folding bike? Folding bikes can be packed away. That makes them easy to store, suitable for carrying on the bus or train, and is a big advantage of you worried about bicycle theft. If you're worried about the possibility of punctures or mechanical problems when commuting, again folding bikes come into their own - as in the event of a problem you can simply fold the bike away and hop on the bus or train. One thing to be aware of though is that folding bikes generally have smaller wheels than other types of bikes. There are many types of tyre choices around, some with puncture-resistant bands and reflective strips, but because of their small size, tyre pressure is especially important - if you let your tyres go soft - riding becomes like running through treacle! Therefore be sure to invest in a decent bicycle pump! ADVANCED DISC BRAKE SYSTEM- Provides a stronger, faster, more reliable stopping power than the traditional V-Brake Systems. Disc brakes also do not wear out your tires and last much longer. Since disc brakes are much more consistent you'll be able to judge braking more accurately. TOP COMPONENTS - Includes Shimano products that are known to last, including derailleur and shifters. Also includes alloy double wall rims with 26" Diamond wheels. Now you can take your bike where ever you go without the need for those pesky bike racks or risking the dangers of locking it up in public spaces with the new Xspec 26" Folding Bikes. The Xspec bike folds neatly in about 15 seconds so you can store in almost any location. This streamline frame design is not just for mountains trails, its also great for students, office workers, urban environments, or any convenient commuting. The 26" frame bike offers you a great ride with the added convenience of portability. The portable folding frame is constructed with High Tensile Steel and comes with reliable, top of the line Shimano components such as Shifters & Rear Derailleurs. The 21-speed function gives you the option to cruise or punch it in high gear. The disc brake technology provides long lasting and gives more stopping power than traditional v-brakes. Dual Disc Brake System that give stronger stopping power and a longer lasting braking technology. Includes Shimano Components that any tourist could rely on. EuroMini is a USA BASED COMPANY, ready to provide you with quality products and FAST SHIPPING! We do our utmost to provide excellent customer service to you. If you have any concerns, please contact us so we can resolve any concerns you may have; before you make the decision to leave a negative review. Folded size: H-27" L-31" W-12.5. 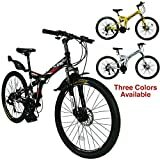 Weight: 27 lbs (Lightweight Folding bike): Maximum weight capacity 240 lbs. The Via is our mid-level bike. Designed for the rider that wants the best of both worlds: premium bike at an affordable price..
EuroMini is a USA BASED COMPANY- Ready to provide you with excellent quality products and FAST SHIPPING! We will do our utmost to provide excellent customer service to you. If there are any concerns, please contact us to resolve any concerns you may have as soon as possible before you make the decision to leave a negative review. If you are satisfied with your purchase, please take a moment to leave a positive review. Your satisfaction is our #1 priority! Tires - Kenda Khan 20x1.95"
Super Lightweight - Weighs only 21.5 lbs. This super simple one-speed alloy folding bike makes a superb commuter. With no brake cables or shifters, there's almost nothing to maintain or adjust. At only 21.5 lbs. this is one of the lightest folding bikes available. Folds quickly to 12" x 32" x 25"
The AVANTI is an economical 20" Aluminum folding bike. The sturdy Aluminum frame is lightweight and will hold up in marine environments. It includes a 6 Speed twist grip gear system, rear rack, fenders and foldable pedals! front/rear steel hub. steel kick stand. Brand new, 90% factory assembled. Riding with style and convenience. This light weight bike (only 33 lbs) can be easily folded within 10 seconds, for easy storage and transportation. It can be fit in a compact car's rear trunk, like Honda Civic, or Toyota Prius. People can use the bike for commuting to work, riding in parks, in camping ground. Recommended for rider's height 5'3"~6'0". People whose height is 5'10"~6'2" may need to buy a longer seat post; Supporting rider's max weight up to 200 lbs; Net weight 33lbs, shipping weight 43 lbs; Folded dimensions 38"x14"x29"; This bike is shipped with front wheel uninstalled, a user can easily install the front wheel within ten minutes, see user manual which come with the bike for detailed description. Blue, Black, Yellow and Silver color available. *This item will not be shipped to Canada. Founded in 1895, Schwinn is an American icon, building some of the best-known and best-loved bicycles of all time. From its very beginning in Chicago, Illinois, the Schwinn mission has been to develop bicycles that allow people to experience the confidence and freedom that comes from riding a bike. Discover the convenience and utility of the Schwinn Loop Adult Folding Bicycle. In just a few easy steps, this brilliant device folds out to a bike that's big enough to accommodate a six-foot rider. Great for camping or RV-ing, this durable, steel bike packs up so small that no bike rack is required. The folded size is 29.5 inches by 29 inches by 19 inches. Tackle small hills and cut through brisk winds easily, thanks to a seven-speed Shimano RevoShift Twist Shifter and Shimano Tourney rear derailleur. The rear carry rack and an included nylon carry bag keeps the bike protected and concealed. Perfect for commuting, this bike features a kickstand and durable steel hinges. This bike ships ready to be assembled and weighs approximately 33 pounds. The wheels measure 20 inches. 20 - inch folding bicycle designed for commuting and exercising.